Can anyone resist the sweet and spicy taste of pad Thai noodles? We think not. In a medium-size pot combine tamarind pulp, fish sauce, brown sugar, paprika, chilli powder, sriracha, and sweet chilli Thai sauce; stir to combine. Over medium heat, bring sauce to a simmer. Cover the pot, remove from heat, and set aside. Fill a large pot with hot water and place the rice noodles inside. Let steep until they are tender but not quite soft enough to eat. In the meantime, prepare all ingredients and place them in bowls. Cooking times are fairly quick so it is important to have all the ingredients measured and readily available. Heat a large wok over medium-high heat and add vegetable and peanut oil. When the oil is shimmering, add the chicken and sauté until no longer pink; about 1 to 2 minutes. Stir in the tofu, garlic, bell pepper, carrots, and 1/3 cup of reserved sauce. Continue to sauté for another 2 to 3 minutes until the tofu and chicken begin to brown. Strain the rice noodles and place them in the wok. Pour another ¼ cup of the reserved sauce over the noodles and stir vigorously to keep everything moving. Test the noodles every 2 minutes to check if they are tender. Once the noodles are soft, push them to the outside of the wok and crack an egg in the middle. Allow the egg to set for 10 to 15 seconds and then scramble them into the noodles. 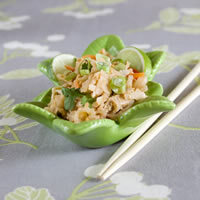 Stir in 2 tablespoons of ground peanuts, green onions, cilantro, and bean sprouts. If the dish looks pale add another 1/3 cup of sauce. Remove from heat. Serve with lime wedges, additional ground peanuts, and hot sauce.